Here is a great recipe from greenhealthycooking.com. Set it up before you leave the house and enjoy at the end of the day. Check it out. Peel and slice red onion and add to the bottom of the slow cooker in one layer. Add chicken thighs on top in one layer. Wash and half baby potatoes and add to slow-cooker. In a small bowl mix zest of 1 lemon, juice of that same lemon, olive oil, honey, thyme, sea salt, pepper and finely chopped garlic and then pour over ingredients in slow cooker. Put lid on and secure, then set to high for 3-4 hours or low for 6-8 hours (depending on your schedule. 3 hours on high being the minimum and 4 the maximum and 6 hours being the minimum and 8 hours the maximum when set on low). 15-20 minutes before the time is over, set slow cooker to high and add asparagus on top and put lid back on. The thicker the asparagus, the longer it will take. 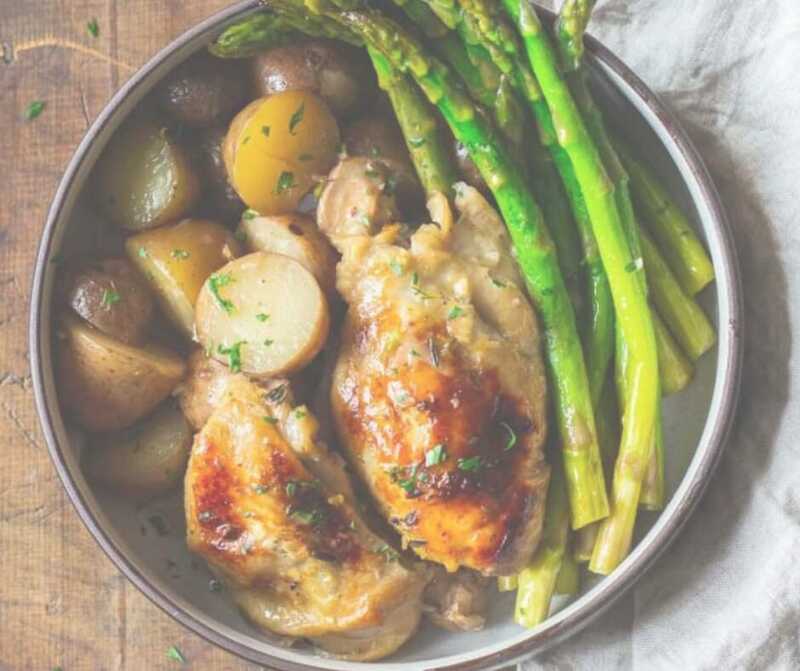 optional but recommended: 5 minutes before the time is over, remove the chicken thighs, place on a baking sheet and put under the broiler on hi for 3-5 minutes or until the skin is golden.